You’ve heard of the Merriam-Webster dictionary, but have you tried their mobile app, available for iOS and Android devices? 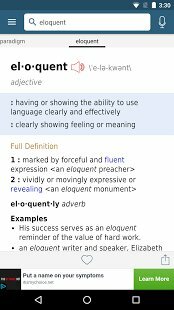 This app gives you access to the Merriam-Webster dictionary, but has several additional features that make it a helpful study tool. Do you ever hear a word like phoneme or euchre and want to look it up, but have no idea how to spell it? The Merriam Webster app has a voice search option which lets you say the word rather than type it. It seems to be fairly accurate at picking up what you’re saying. This option is really helpful for anyone who struggles with spelling or anyone who hears a lot of new words, which is basically all college students. Another struggle some people have with using the dictionary is having to look up three more words every time just to understand the definition. The Merriam-Webster app defines any words in the app by clicking on it. This can save time and help you learn the words better. In the corner of the app, there’s a button you can click on to see all of your most recent searches. This is particularly helpful when used in conjunction with the previous feature. For example, say you’ve clicked on several words in definitions to find out what they mean, but you’ve forgotten how they apply to the word you initially looked up. With this feature, you can quickly get back to the original definition you looked up to piece together the whole meaning with the words you’ve looked up. The Merriam-Webster app does have the option to be used offline, although it has to be set up while you are online. While offline, you can only look up definitions. Features like pronunciations and games are not available. Most words have a pronunciation voiced by a real English speaker, so you can hear how they are properly pronounced. This is particularly helpful for when you have to present on or talk about something that you’ve read, but never heard someone say. Don’t let your well-researched presentation on the Triple Entente or systole and diastole get ruined by mispronunciations! I have seen this happen to other grad students. It’s also helpful for when you’re talking with friends. You’ll sound much cooler if you can pronounce espadrille and ombre! If you have an Apple Watch, you can look words up by voice search directly from it. You can also get Word of the Day updates on it and keep a list of favorites. Check out the Merriam Webster app for iOS here and for Android here. The free app has all of the functions above but included ads. If you want to get rid of the ads, you can upgrade to the paid version. This entry was posted in Tech Blog and tagged Android, App of the Week, Assistive Technology, CSDTech, Dictionary, iOS, Mobile Devices, Study.